Now entering its 34th year, the Georgia Renaissance Festival has been a favorite of Atlanta families for two generations! Situated on 32 acres south of Atlanta in Fairburn, GA, the fair recreates 16th century England. Ten performance stages are located throughout the festival, with acrobats, jugglers, musicians, magicians, and of course, everyone’s favorite, the joust! More than 150 artisans will be on site, both selling their Renaissance themed wares and offering demonstrations in crafts such as glass blowing, weaving, pottery and coin mint. For kids there are games, rides, a petting zoo, arts and crafts and an exciting Birds of Prey show. But one of the things people love most about the Renaissance Festival is the food. Expect to see attendees and festival characters alike walking through the grounds in full costume, with a smoked turkey leg in one hand and a “mug of glug” in the other! The Georgia Renaissance Festival has been voted one of the Top 20 Events in the Southeast and one of the Top 100 Events in North America, and has become an annual tradition for Atlanta families. 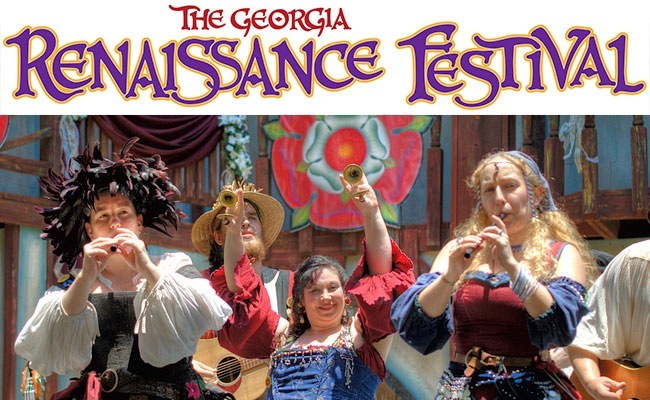 For tickets and more information, visit the Georgia Renaissance Festival website! Ready for a renaissance in your own surroundings? Check out our featured listings here!